Take advantage of Calypso Cay timeshare resort promotion to save $100's on your room cost. Calypso Cay Resort is a Premiere Time Share Resort located minutes away from Walt Disney World, Universal Studios Florida & Sea World. Resort offers free scheduled shuttle service to these attractions. Free onsite parking is included. Forget staying in a cramped hotel room. Your Calypso Cay villa is spacious and bright! The beds are large, comfortable, and inviting. Our tropical themed pool is perfect for the entire family! Take a timeshare tour to stay for less. Great resort accommodations near Disney for less!! Castaway Cove Adventure Park is a fun filled activity center located within the Calypso Cay timeshare resort. This thrill park has a 300-foot Fly Wire Zipline taking you across the area at treetop level. Hone in your rock climbing skills on the challenging 26-foot rock wall or scale 20-foot Spider Climb then take the plunge down a giant inflatable slide. Bungee jump on the Extreme Air Jumper. Head over to the balloon battle station if your looking to cool off. We stayed at Calypso Cay for two weeks and had an awesome time! It was close to everything. We loved the pools and the facility. We used the grill two days in a row and that was wonderful. The pools were awesome for the kids, there were plenty of towels by the pool, and if we had a question/problem, it was quickly resolved. We would stay again here in a heartbeat. I'm already thinking when my family can go next summer! If you're looking for a small, relaxing resort that is affordable, this is it!!! The kids loved the mini waterslides and playing with their cousins more than visiting Disney. Would stay there again in a minute. Wonderful vacation. My family was in the 5000 building. 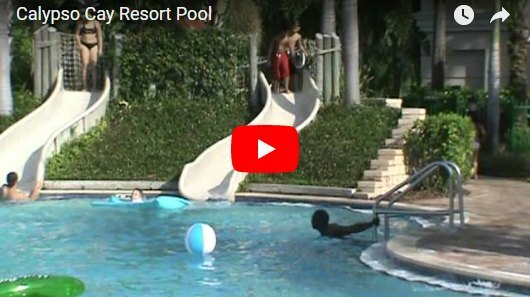 Short walk to the pools with waterslides, hot tubs, play ground, splash pad, minuture golf, rock climbing, zip lining, bungy jumping. Beautiful view of the pool from our screened in balcony. I was nerveous from the other reviews but we loved the place. Our unit was clean. Our kitchen was fully stocked with nice dishes, pots n pans, non stick frying pans without scratches. Plenty of silverware. It came with toaster, microwave, clean beautiful stove, towels, soap, washer dryer, dishwasher, 2 TVs, ironing board, fridge n ice maker. We went next door to the Holiday Inn express that shares ammedities and hopinng to buy breakfeast buffet but that is only for Holiday Inn guests. That should change. Charge us and feed us. All I can say is we will be back. When u check in look around they do have luggage carts. Should have ice machines though. The fridge had trouble keeping up with our demand. Cicis pizza for a meal is 1/2 mile. Enjoy we did. I checked into the Resort July 23rd. I was really nervous about some of the negative reviews that were made, but I also considered the positive reviews as well. Which put me on the fence. However, when it was time to check into the Resort, it was a smooth transition, which calmed my fears. The gentleman at the front desk was extremely professional and friendly. When we arrived to our apartment and I was pleasantly surprised. It was clean; there were towels, pots, utensils, everything you would need; home away from home. We were their a week, and were very comfortable. Love resorts because the activities are their for the kids to participate in. We will definitely utilize this resort for future family Vacations and recommend other to do so also. Peace and Blessings, Give it a try!! Got everything I was offered and more. Staff (Alexandra) at the front desk was an absolute Rockstar! Resolved any questions or concerns immediately. Room was spacious and had everything we needed. The kids LOVED the amenities. Highly recommend!!!!! All US states and most International countries qualify. * Three nights + $200 Visa Gift Card for Disney or Universal just $189.